I just learn Margaret Ford, wife of Skip Ford, passed today. She was an ADS judge, avid daffodil grower and shower here in my home state of Virginia. I know many remember her as she and Skip attended many conventions. So very sad to learn this. Just a wonderful lady and such a pleasure to be around. Betty and I are so sorry to have this news. Such a lovely lady. We had the pleasure of being house guests of Skip and Margaret and they visited us here in Northern Ireland. Our sincere condolences to Skip – we had good times together at conventions and on the golf course. Ah, time and people pass! We were traveling by car from NJ to NC today and just learned that Margaret Ford passed. Fran and I are so sorry to hear the news. We considered Margaret and Skip personal friends and always looked them up at daffodil shows and meeting. It is such a loss to the daffodil world that Margaret is no longer with us. I have so many memories of the two that it would fill a book. 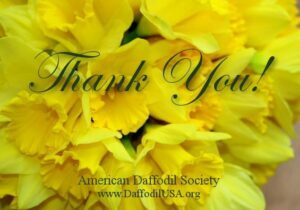 There is a lovely article in the Richmond, VA, newspaper about Margaret and how she spread the joy of daffodils to children. The full article is available in DaffLibrary under People. Janet, thanks for this. I couldn’t get to DaffLIbrary, but here’s a link to the paper, for anyone who is interested. join the VDS and ‘talk daffodil and keep the yellow fever spirit’.